I’ve been doing machine design for about 10 years and I often compare the mechanical design process to a creating a jigsaw puzzle. The most obvious parallel is that there are many pieces for both a machine and puzzle that must fit and work together. Even simple machines are broken down into multiple subassemblies that need to fit together like puzzle pieces. Each subassembly piece has to fit together in the process and in the context of the overall machine, both in a static and dynamic state. If one piece needs to grow your other pieces may need to shrink. You may have a rough idea of what the final puzzle may look like but you’re figuring out the pieces as you go along. The puzzle process gets more challenging when you remember you’re dealing with 3D pieces and working collaboratively. The best advice here is to divide the puzzle so you can each work a corner and have someone paint the broad strokes so you know what the completed puzzle will look like. 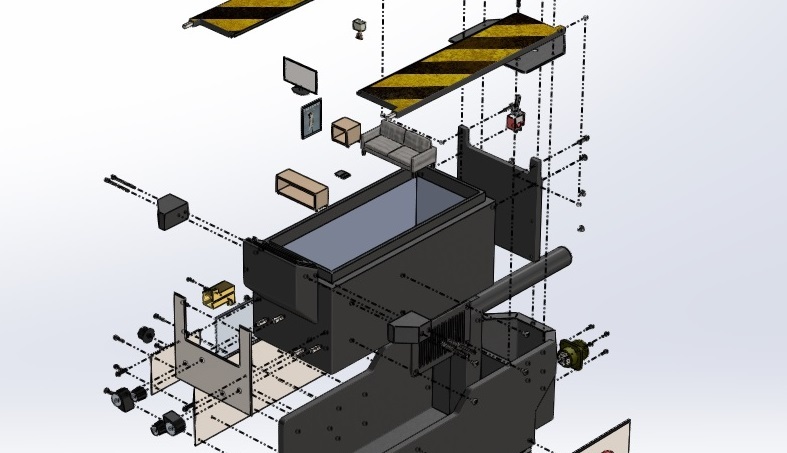 Machine design is complicated because in many cases you’re fitting together dynamic systems and subassemblies. There are a few constraints or requirements that shape the design from the start but there are many self imposed constraints that arise during the design process. Things like part clearances, working planes, conveyor pitches, and transfer points need to be established. These factors will greatly influence your design along with a common thread that ties everything together.